London's events calendar really heats up in the summer months, and 2017 is no exception. The city looks set to sizzle with a series of blockbuster exhibitions, food and drink festivals and brand new openings. We've highlighted eight of the best events on offer this year. What: Billed as a festival-style exhibition, Into the Unknown: A Journey Through Science Fiction is the Barbican's blockbuster summer event for fans of all things sci-fi. Explore more than 800 works including manuscripts and drawings by Jules Verne, original props from films including Godzilla and Jurassic Park, concept art from Star Wars, vintage artwork depicting Soviet visions of space and rare superhero comics. Several events will run alongside the exhibition including talks, workshops and film screenings. Where: Barbican Centre. The nearest tube station is Barbican, on the Circle, Hammersmith & City and Metropolitan Lines. What: Celebrate of all things gin at the London Gin Festival, a three-day event that showcases some of the finest juniper-based spirits in the world. You'll get to sample more than 100 different kinds of gin as well as learn from industry experts through talks and masterclasses at the Tobacco Dock, a converted tobacco warehouse in Wapping. The cocktail bar will serve all sorts of potent concoctions and you can enjoy live music and food from a range of gourmet stalls. The ticket price includes a Gin Festival Copa Balloon Glass. Where: Tobacco Dock, Wapping. The nearest tube station is Wapping, on the London Overground. What: The 'world's greatest restaurant festival' returns to Regent's Park in June to showcase London's first-class dining scene. Foodies flock from far and wide to Taste of London to sample small plate dishes from the city's best restaurants including Roka, The Cinnamon Club and Pizarro. It's a great way to get a flavor of London's top eateries without having to fork out for a full meal. As well as the tastings you'll get to meet Michelin starred chefs including Tom Kerridge and Alex Atala, see live cooking demonstrations, join hands-on workshops and shop at boutique food markets. Where: Regent's Park. The nearest tube station is Regent's Park, on the Bakerloo Line. You could also consider Great Portland Street, on the Circle, Hammersmith & City and Metropolitan Lines, and Warren Street, on the Victoria and Northern Lines. What: Explore over 200 gardens across London as part of the annual Open Garden Squares Weekend. One ticket includes access to all gardens including contemporary rooftop developments, grand estate grounds and private garden squares in central London that are not normally open to the public. Additional events include guided walks and tours, live music and poetry readings. Where: Various locations across London. What: New for 2017, Pergola Paddington Central will be west London's largest outdoor drinking and dining venue when it opens this summer. The brand new rooftop venue in Paddington Basin will feature food stalls including Patty & Bun (topnotch burgers), Mamalan (dumplings and Asian street food) and Decatur (Creole comfort food). Sample dishes on communal benches under a fairylit roof to the sounds of a resident DJ or live band. Where: Paddington Basin. The nearest tube station is Paddington, on the Bakerloo, Circle, District and Hammersmith & City Lines. 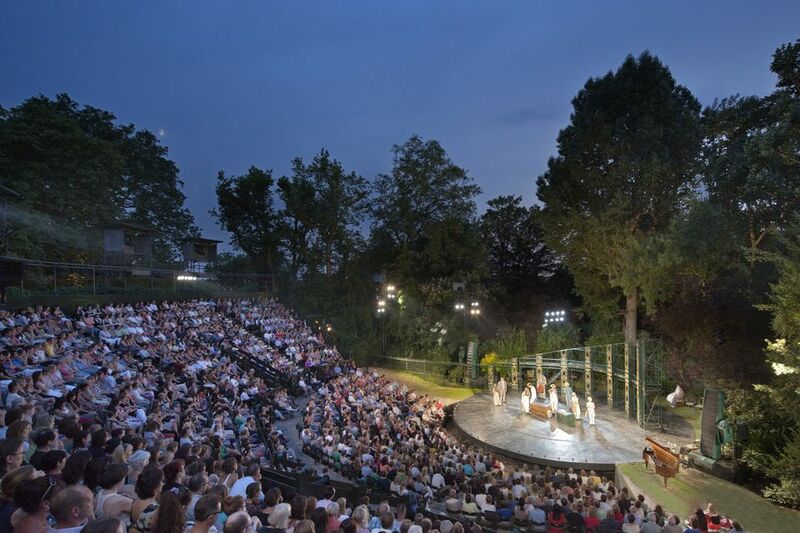 What: Get an alfresco culture fix in Regent's Park this summer by nabbing tickets to see A Tale of Two Cities at the award-winning open-air theater. This contemporary adaptation of the classic Victorian novel by Charles Dickens explores social inequality and forms part of the theater's summer season. Upgrade your evening by booking dinner on the terrace (main courses are served before the curtain lifts and dessert and coffee are enjoyed at the interval). Where: Regent's Park. The nearest tube station is Baker Street, on the Bakerloo, Jubilee, Circle, Hammersmith & City and Metropolitan Lines. What: This stylish exhibition at the Design Museum explores California's influence on the world of design and showcases iconic pieces from the Golden State including skateboards, self-driving cars and iPhones. The exhibition spans designs from mid-century modernism to Silicon Valley's tech culture and is the first show to celebrate California design across a number of different eras. Where: Design Museum, Kensington. The nearest tube station is High Street Kensington. What: London's popular Festival of Love returns to the Southbank Centre this summer with a series of events, art installations and live performances that celebrate togetherness. The summer calendar ends with the Big Wedding Weekend, a mass group wedding event. Where: The Southbank Centre. The nearest tube station is Waterloo, on the Bakerloo, Jubilee, Northern and Waterloo & City Lines.